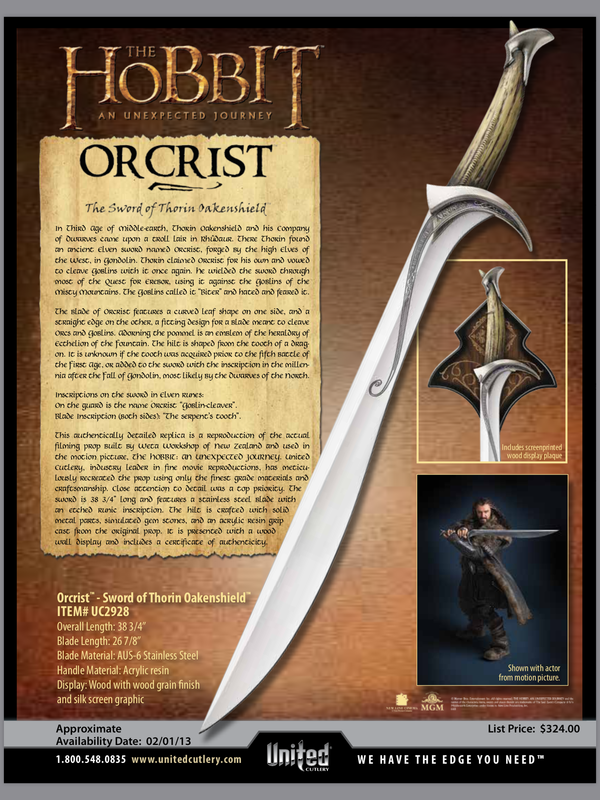 Orcrist is an elf created sword found during the journey of Thoren Oakenshield, a dwarf, in Middle Earth… and features in the Hobbit movies. I handled the Orcrist prop used for the movie while on a visit to Weta Workshop in Wellington, New Zealand and saw one of the limited edition weapons-grade replicas at the Royal Armouries in Leeds, Yorkshire, UK. I made use of a Blender model by VoltaJack_ from Sketchfab which is licenced CC-BY. 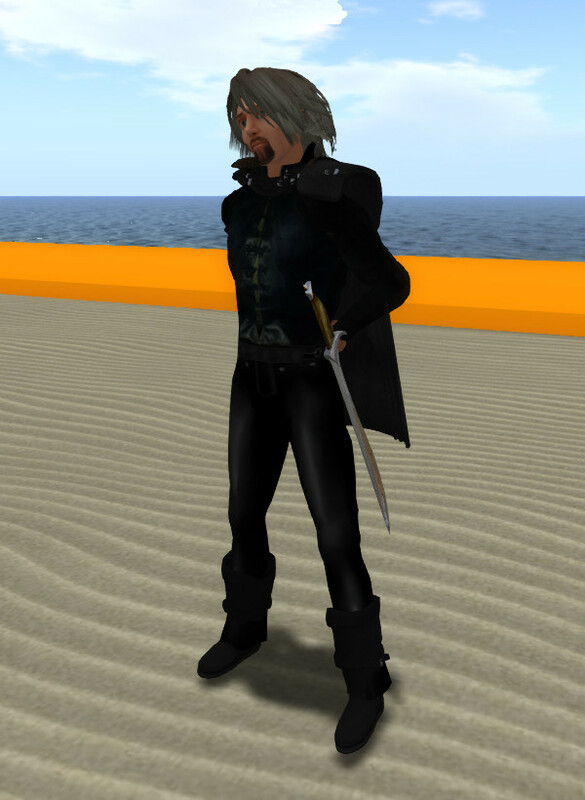 Poly reduction and tidy up for OpenSim was done by Fred K. Beckhusen (Ferd Frederix) of Micro Technology Services, Inc. and I did the final texturing, adjustment of scale and wearable positioning and packaging. The mesh reduction method as described by Fred is as follows. Starts at 236K triangles – about 10 X the limit. I applied a Decimate Modifier at 0.1 ratio (90% reduce) and it went to about 25K tris. Still over 4 avatars worth of triangles and more than the 21K limit. Did a 10X again (a total of 100X reduction) and it came in at 3,440 tris, looks acceptable, still a lot more than a custom build from scratch, but that what you get when you start with a high poly model. 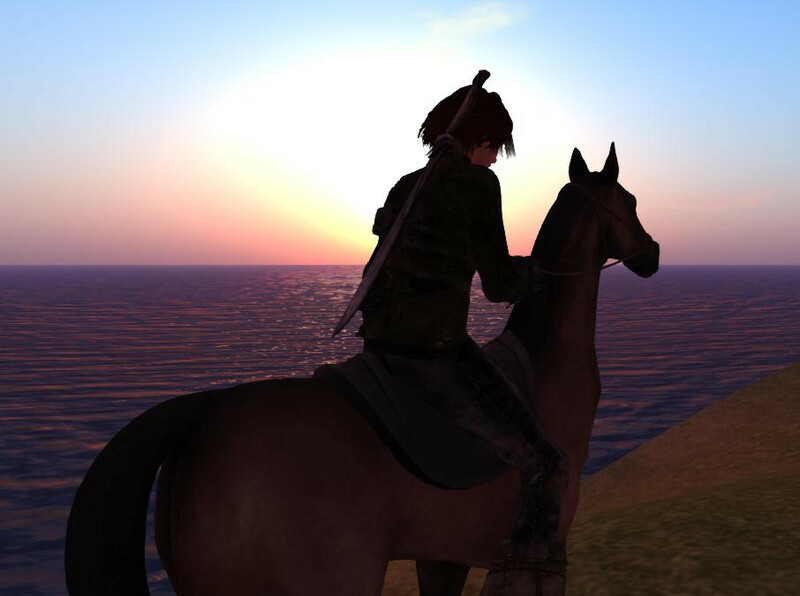 Then select all the vertexes in Edit mode with ‘a’, and do a Vertex (Ctrl-V)->Remove doubles. 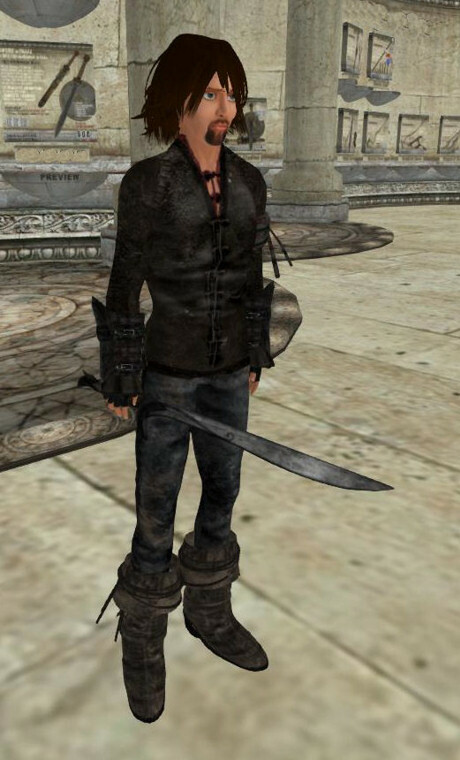 This drops extra vertexes. Last one is Mesh->Cleanup->Limited Dissolve. This gets rid of extra dots and lines by collapsing them away. 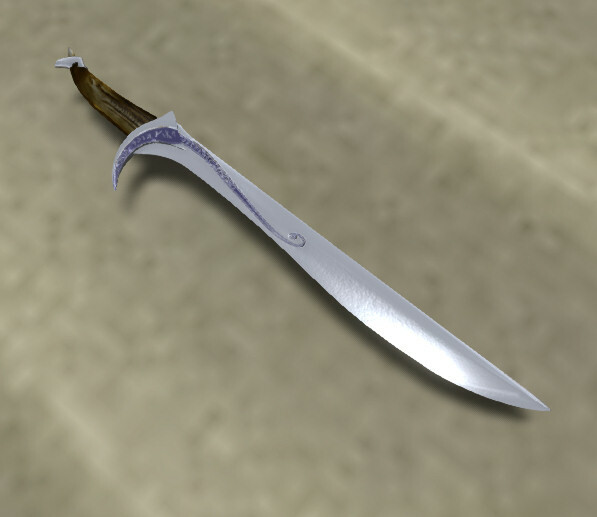 Added a smooth shader and an edge split modifier to get the blade smooth but with a sharp edge. Adds geometry, but it looks much better. Final is 3.5k tris, versus 236K. I can get it to 1.5K, but it would need more manual cleanup. I did clean up some few tris the distorted in it. 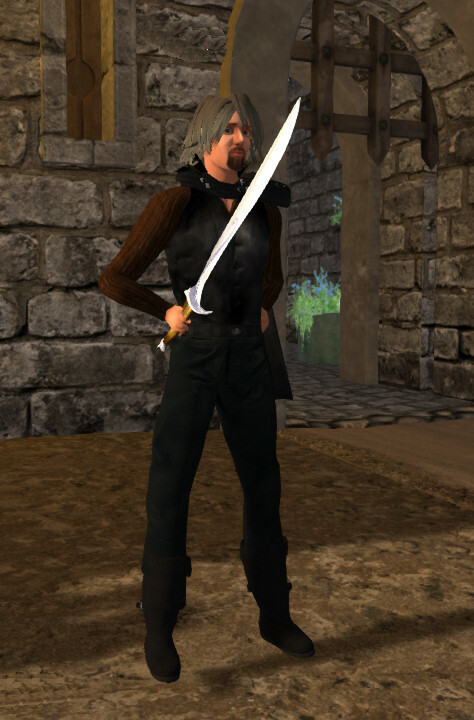 Separated the end of the sword so you can add a texture. 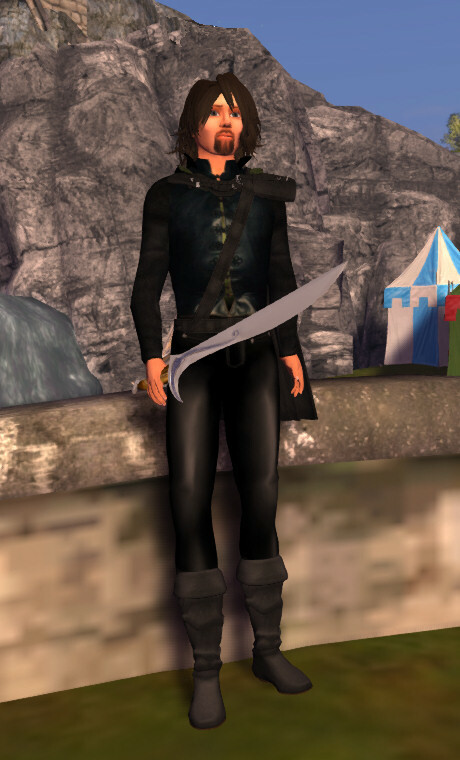 For a while my Second Life avatar has had an Orcrist sword purchased from the Second Life Marketplace. 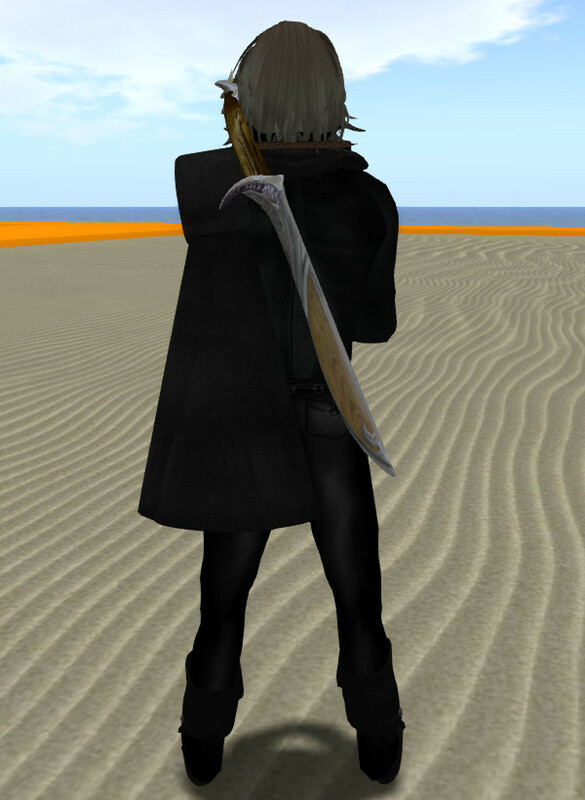 This is shown below alongside the new Orcrist in OpenSim. As of September 2018 I now have an Orcrist Sword Prop Replica made by United Cutlery. 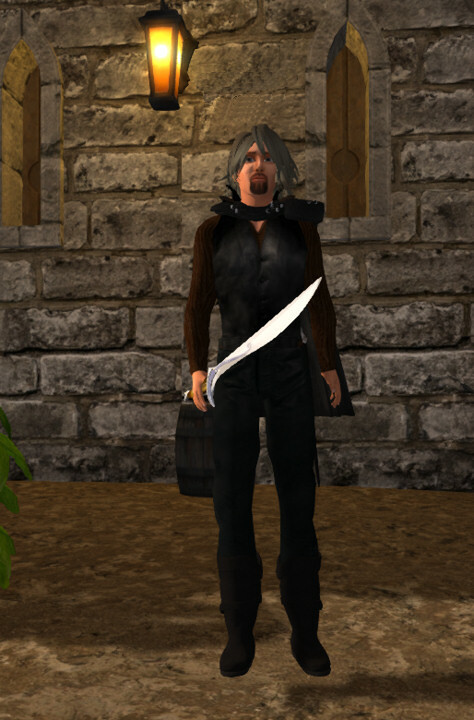 This entry was posted in Games, OpenSim, Virtual World and tagged OpenSim, Orcrist, Sword, Virtual World. Bookmark the permalink.